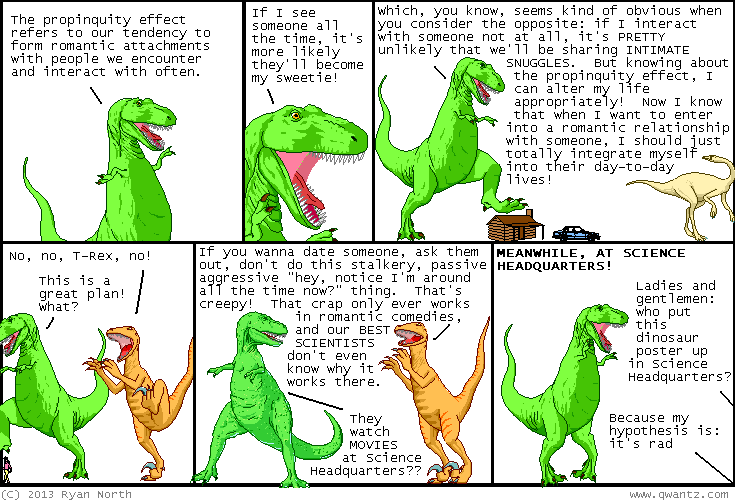 Dinosaur Comics - April 25th, 2013 - awesome fun times! –Why is this bothering me so much? April 25th, 2013: I wrote this comic in 2009, finalized it, and then got distracted and COMPLETELY FORGOT ABOUT IT. I happened across it now entirely by accident (I was searching for the phrase "little hearts" which appears in some cut lines to this comic!) So here is a KLASSIC KOMIC that you should've read over four years ago but you get to read it now. Thanks, past me! You were good at writing comics but bad at actually putting them where anyone else could ever see them. In other news, Squishable Utahraptor wants to live in your house! One year ago today: if you learn one thing from dinosaur comics, let it be that the cloaca is their shared digestive, urinary, and reproductive tract.